Secluded, oceanside home located on the Circle Drive pond. 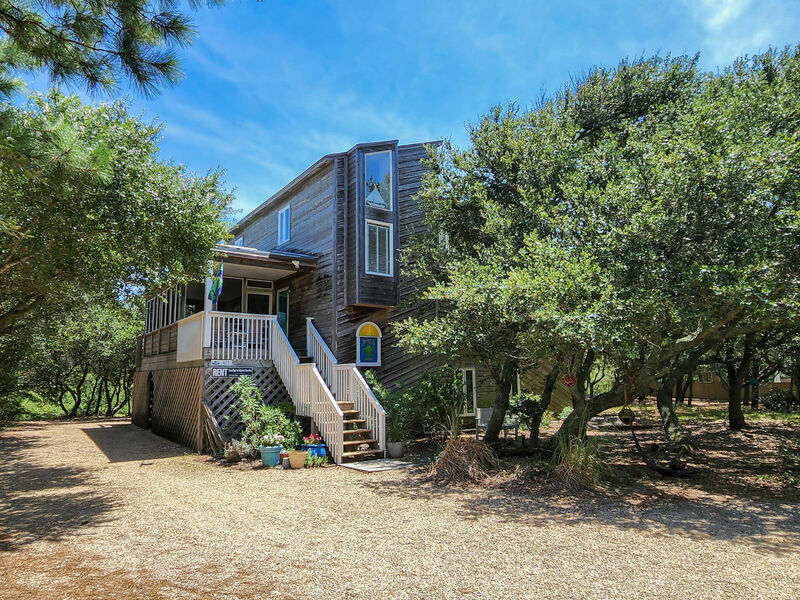 Bring your kayak, fish, feed the turtles or just enjoy the serene view from the rear deck. Only a short walk to beach access with no main roads to cross. Perfect for two families with sufficient onsite parking. Easy access to shopping and dining in Duck, NC. You'll beat the summer traffic with the Friday to Friday rental. 2 bedrooms (master suite with Queen, 1 with Twins), full bath (with 2 person jacuzzi, glass block shower, separate dressing area, sitting area). Vaulted living room with wood burning fireplace, sunroom, dining room, kitchen, 1 bedroom (with King) with entrance to screened porch. 2 bedrooms (1 with Double, 1 with Twins) full bathroom, lofted sitting area overlooking living room.